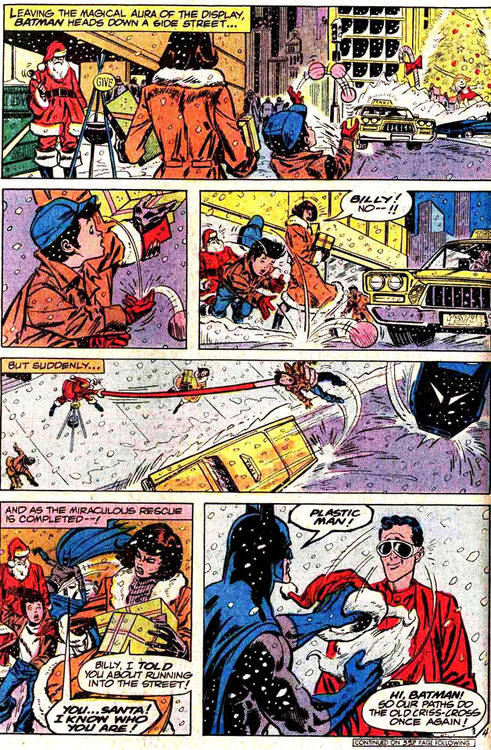 I’m telling you guys, Plastic Man and Batman are like, total bros.
And why not? Sure, there’s the modern idea of Batman wanting to keep an eye on powerful friends and foes alike, but the two also have something in common — they’re both orphans. I don’t think this has ever really been explored in the comics (at least not explicitly), but I like to think Bruce looks at Eel and realizes how easy it could have been for him to go in that initially criminal direction. Instead of having a mansion, an incredibly dedicated butler and a bajillions of dollars to fall back on, Eel wound up in an orphanage when he was 10 years old, alone and with no one to rely on but himself. You tell me which outcome happens more often. I also like to think that Batman sees the hope for redemption in Plastic Man, which is why he’s tried so hard to support, cajole and browbeat him over the years and through various iterations. Like the Joker, Eel was a crook who was doused with a toxic mix in a chemical factory while trying to dodge the authorities. The difference is that Eel woke up in the care of people who owed him nothing, but still gave him a chance because they saw the potential for good in him. Powerful stuff, and enough to make Eel instantly change his ways and become a hero. A hero, I might add, who enjoys being a good guy, in stark contrast to a certain pointy-eared vigilante. 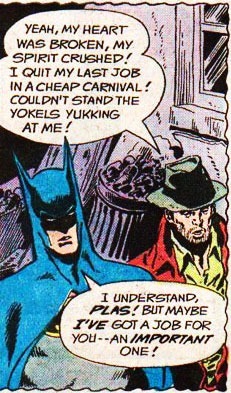 Besides, look at that smile on Batman’s face; you just know he totally digs hanging out with his old pal Plas! Plastic Man got some love from Comics Alliance today, courtesy of his appearance in The Brave and The Bold #123 — in which a panhandling Plas is asked to fill in for the Caped Crusader, and is promptly brainwashed into forgetting he’s not Batman. It’s good fun, and definitely worth a look! Have a merry — and safe — Christmas, everyone!